Summary: Charles and Irene (alter egos for the two authors) are forced to work together on a poetry project in their fifth grade classroom. Both are apprehensive; Charles is black and Irene is white; he is a non-stop talker while she is quiet and shy. 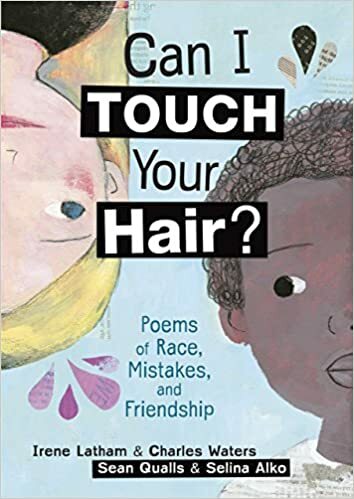 But through their poems, they find some common ground, like arguments with parents, church, reading, and difficulties with other kids in and out of school. Race is a common theme, from Irene’s struggles with Shonda, a black girl she would like to befriend, to Charles’s bullying by white kids wearing cornrows and dreadlocks (“I’m confused: why do people who want to look like me hate me so much?”). They bond over an author visit by Nikki Grimes, and by the time the project ends, their teacher is having to shush them (“Irene, I never thought I’d ever say this to you, but you need to be quiet”) when they talk too much during work time. Authors’ and illustrators’ notes tell more about their collaboration. 40 pages; grades 3-6. 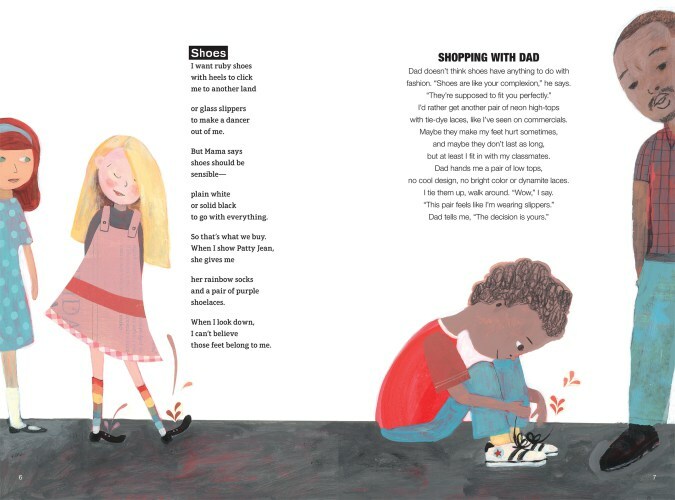 Pros: Poetry tells the story of two very different children who discover they have more in common than they have ever suspected in this celebration of friendship and the written word. Cons: Irene’s father reaches for a paddle when her two younger brothers get in trouble. Also, not a con so much as a heads-up to be aware that references to Trayvon, Ferguson, Missouri, and the use of the n-word in rap music may raise some questions.